He served in World War I and World War II…he’s still one of Germany’s most respected military leaders…and yet he never even wanted to be in the military. Who is this man that led German troops to victories, but defied Hitler at his own peril? What made him who he is, and what keeps his name in the history books? 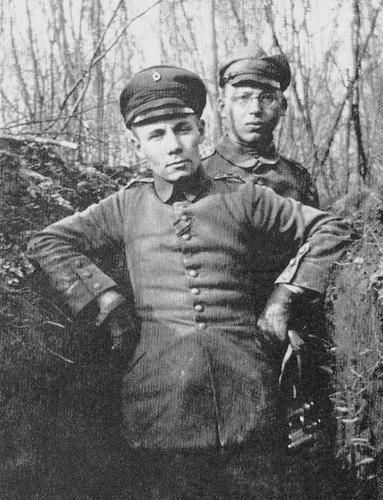 Born in Germany in 1891, Erwin Rommel didn’t have the military in his DNA…his father was a teacher, and he was the only member of his family to enter the military as a career. Of his three siblings that lived to adulthood, one brother became a dentist, another became an opera singer, and his sister became an art teacher. As a child, Rommel wasn’t particularly athletic…in fact, he’s even been described as frail. But he hit his stride in his early teens, discovering sports and becoming a leader among his peers. Around the same time, he also discovered his love of mathematics and engineering. He built his own glider, and was known to spend his free time taking apart machinery and putting it back together again. A teenage Rommel even dismantled an entire motorcycle and rebuilt it. He was clearly intelligent, but his grades didn’t reflect it. Without good grades, Rommel couldn’t continue his education at university. With his talent for machinery, he considered working at a factory near his childhood home, but his father didn’t want him working there. Instead, his father pushed Rommel into military service. 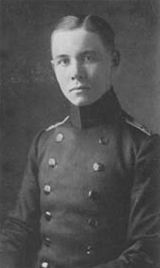 At the age of 18, Rommel began studying at the Officer Cadet School in Tokyo as part of the 124th Württemberg Infantry Regiment. He graduated in 1911, and by January of 1912 was commissioned as a Lieutenant. As a battery commander, he became part of the 124th Weingarten Regiment. Though he showed his military talent early on, he was still a young man and it’s no surprise that Rommel had more going on his life than just his military service. 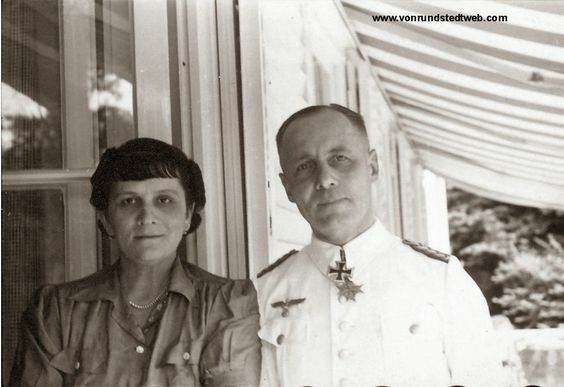 Rommel had met a young woman by the name of Walburga Stemmer while he was posted in Weingarten. The two began a romance, and Walburga ended up pregnant. When Rommel learned of her pregnancy, he promised her they would marry and live in a house, be a family. Before they could marry, Walburga gave birth to a daughter she named Gertrude. Months later, Rommel, stationed away from Weingarten, sent Walburga a letter that contained far different news than what she expected. The letter broke the news that he couldn’t marry her. She wasn’t from the right class to be an officer’s wife, and Rommel’s career was his priority. Then, there was the fact that he was in love with another woman. The other woman was Lucie Mollin. She and Rommel met while he was in Cadet School, though they did not marry until 1916. Rommel’s clear commitment to Lucie did not stop Walburga from loving him, though. She stayed devoted to him for years, believing that as long as he never had children with another woman there was a chance he would return to her. In 1928, Walburga learned that Lucie was pregnant with Rommel’s child. Unable to deal with the news, she killed herself. Rommel and Lucie were supportive of Gertrude, both financially and emotionally. They welcomed her into their home, though they did introduce her as their niece. When Rommel was fighting in Africa, the scarf that he wore was knitted for him by Gertrude. Rommel and Lucie’s own son, Manfred, was born in 1928 and even went on to become Mayor of Stuttgart for twenty years. As Rommel’s family life was taking shape, so was his military career. Months after his illegitimate daughter was born, World War I broke out. Rommel began his war service as a platoon commander in Verdun, where he soon established the fearlessness he became known for. Only a month into the war he charged a group of French soldiers with a bayonet on his own. He had no ammunition, but the French troops did. Rommel was shot in the leg, and that was only the first of several injuries he sustained during his military service. Rommel served in France, Romania, and Italy during World War I. He was not only respected for his courage, but for his leadership in implementing new strategies and maneuvers for warfare. One of Rommel’s most exceptional victories came as he led troops in the mountainous region of Caporetto, Italy. Rommel’s troops were poorly fed, conditions were horrific, but with the use of new infiltration tactics, the German and Austro-Hungarian troops had a decisive victory over the Italians army. 9,000 Italian men were captured…150 of them officers. 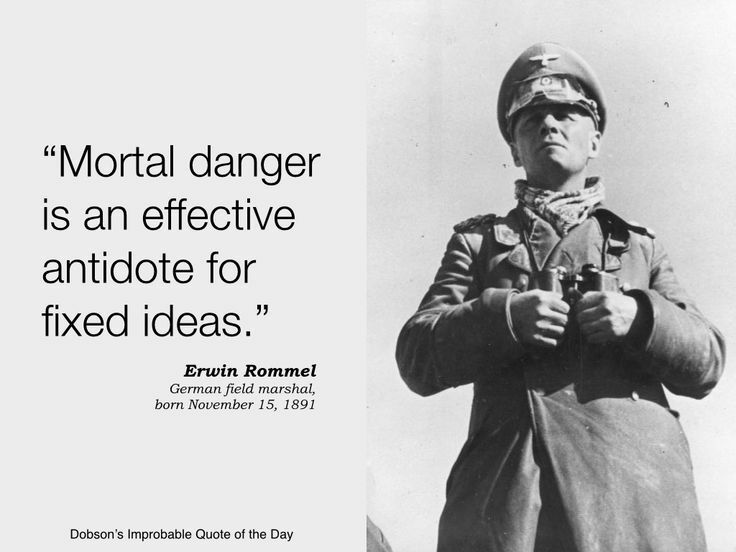 Rommel didn’t achieve this by following orders…quite the contrary. When he was told to stand down, he moved forward and attacked. He was also used a strategy of coming at the attacks from surprising directions…creating confusion and disorder among the Italian troops. 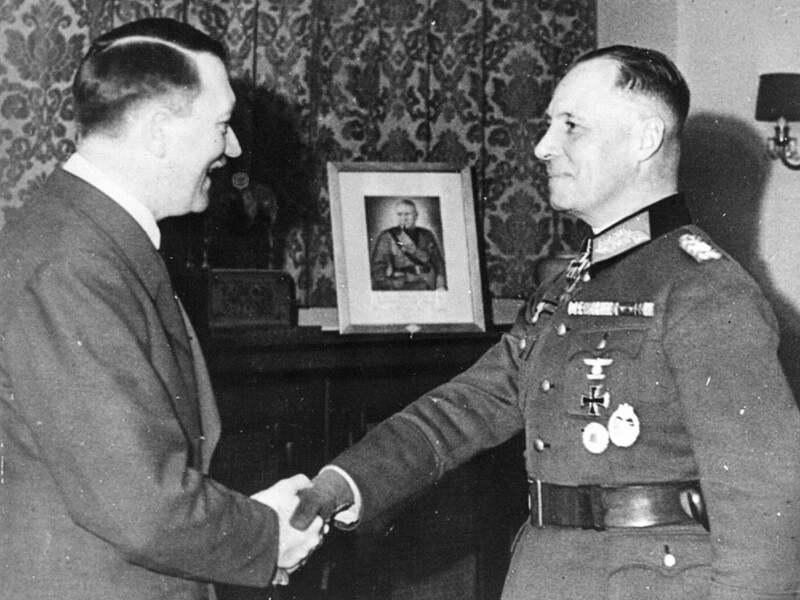 For his role in the battle, Rommel received the Pour le Merite, a prestigious German order of merit. Even before his achievements at the Battle of Caporetto, Rommel had earned the Iron Cross and been promoted to First Lieutenant. In 1918, he received another promotion to Captain. When World War I ended, Rommel stayed in the military, leading the 13th Infantry Regiment in Stuttgart. Most of the work involved dealing with civil unrest, but Rommel didn’t use the same aggressive tactics he was known for in the battlefield. In fact, he avoided using force as much as he could. Negotiations took the place of action in the town of Lindau. Rather than attack the communists who were staging an uprising in the town, Rommel used diplomacy to get the city’s government back under control. Recognized for his leadership capabilities, Rommel was soon appointed to teach at the Dresden Infantry School. During this time, Rommel also set to work putting his military strategies on paper. In 1934, Rommel’s book on infantry training was published. He was no longer teaching, having left that role in 1933, but was leading troops in Goslar. In Goslar, he encountered Adolf Hitler for the first time. Hitler was Chancellor, and in Goslar to inspect troops. By 1937, Hitler was well aware of Rommel and his reputation. He named Rommel as the War Ministry Liaison for the Hitler Youth…but Rommel was not a member of the Nazi party. 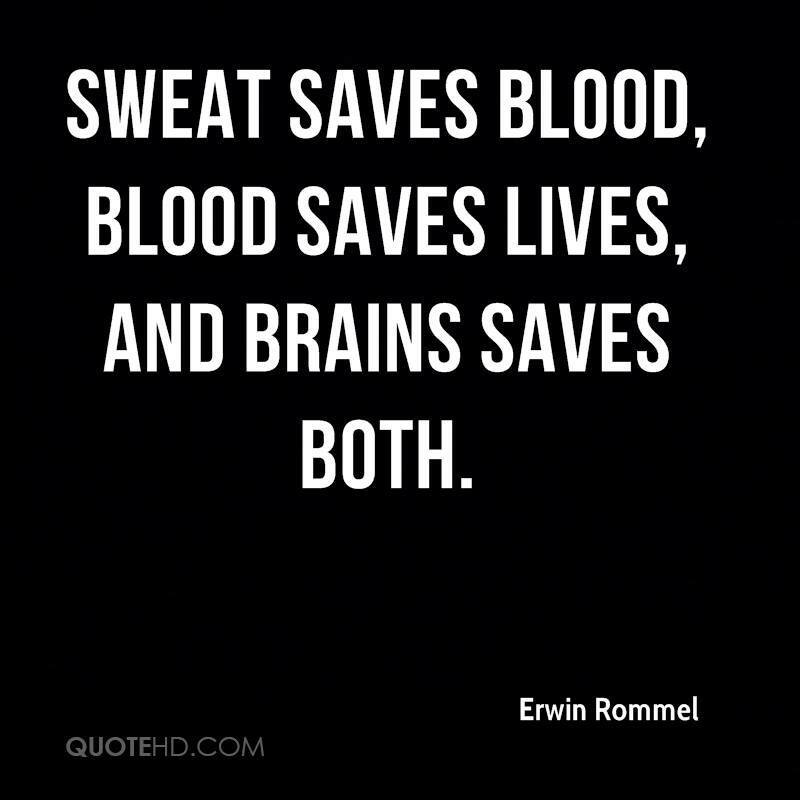 Erwin Rommel Quote: Sweat saves blood, blood saves lives, and brains saves both. He and another Hitler Youth leader disagreed about tactics and organization for the group, and in the end Rommel lost his role in 1938. And Hitler still wanted Rommel in the upper echelons of the military. In fact, he made a direct request that Rommel be part of the unit that traveled with Hitler. 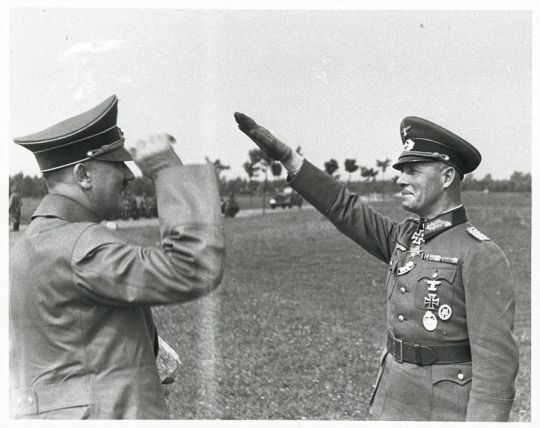 The assignment not only gave Rommel access to the Fuhrer, but it also gave him more free time for his hobbies and interests than he had ever had. He once again started focusing on math and engineering, and even took time away to go skiing. But war was just around the corner. 1939 was a watershed year for Europe and the world. Under Hitler’s orders, Germany invaded Poland on September 1, 1939. As part of the preparation for the invasion, Rommel had been promoted to Major General and was entrusted with protecting Hitler as war erupted. Then, in 1940, Rommel was put in charge of the seventh Panzer division. The panzer divisions – made up of armored tanks – were an ideal opportunity for Rommel to put his particular strategic skillset on display. Initially, plans were for Rommel to head up a mountain division – but with Hitler’s support Rommel was able to land at the head of the division he wanted. In addition to armored tanks, Rommel was also leading rifle regiments, a motorcycle battalion and an engineer battalion. And he was doing this out of the usual order of military protocol. 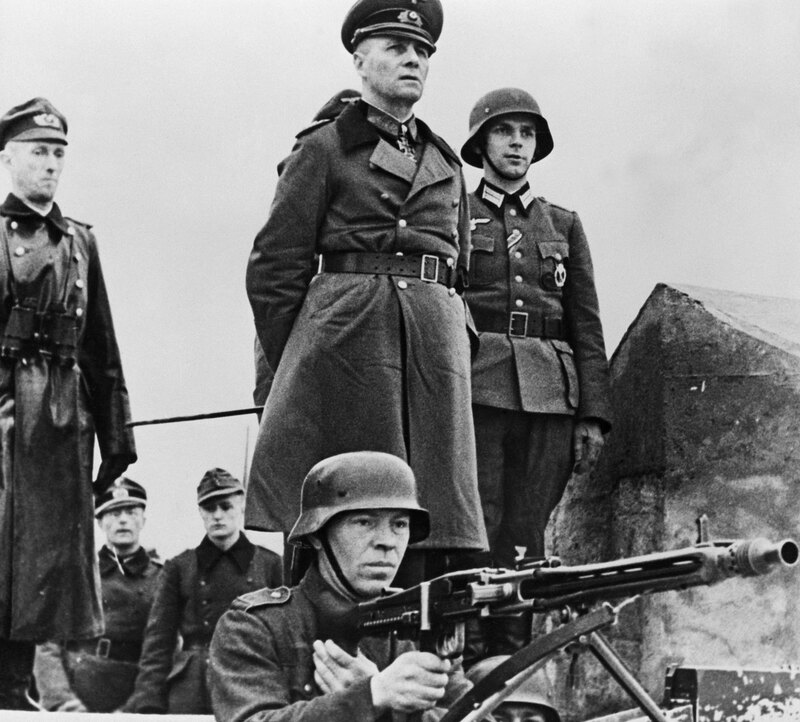 When Hitler made Rommel a general, he bypassed other more experienced military men to do so. This started some grumblings within the German military, but Rommel soon proved himself worthy of the rank. He put his division through their training paces for months, and in May they set off for battle in France. The battle didn’t start out well for Rommel and his troops…bridges were out where they needed to cross a river, and the French were firing, stopping the German troops from making attempts to cross. But Rommel outsmarted them…he set buildings on fire, creating a wall of smoke that gave his troops cover as they fired back across the river at the French. Then, they got in rubber boats and made their way across the water. Using materials from another panzer division, they built a bridge, and the full division moved across. Rommel wasn’t just standing back giving orders. No, the general was actually in the thick of the action, firing a machine gun and even wading into the water to help put the bridge together. Once across, Rommel’s division made quick progress. Within days, they had captured 10,000 French soldiers and only lost three dozen of their own. For this victory, Rommel was awarded the Knight’s Cross. After the German takeover of France, the plan was at first for Rommel to head to Britain…that would be the next nation that Germany would take over. But it was decided German’s air force wasn’t strong enough to do what was needed to take over England, and instead Rommel was sent to Africa. The Afrika Korps was a newly created division of the German military, and General Rommel was the man to lead it to victories. The Italians had been suffering crushing losses in northern Africa, and Hitler wanted the Germans there to help beat back the British. Rommel arrived in Libya in 1941, and he was supposed to answer to the Italian commanding military officer. But he disagreed with the Italians’ tactics. They wanted the Italian and German troops to use a defensive strategy…Rommel wanted to advance and take on the British directly. Hitler agreed with Rommel, and Rommel began planning an offensive. The British, however, had no idea that was the plan. Their only intelligence was that Rommel’s orders were to stay put. When he moved his troops forward, they were caught well off guard. Rommel’s sly maneuvering had proved fruitful for him again. But the nickname he earned for his clandestine maneuverings in Africa is what has stuck through the decades of history: The Desert Fox. But his successes came to an end. The British recaptured the city of Tobruk, and Rommel’s gains had been lost. Then, Rommel was part of a crucial meeting with Hitler and another German military leader, Albert Kesselring. The two Field Marshals disagreed in how the Germans should move forward in Italy…they presented their arguments, and Hitler agreed with Kesselring. Kesselring took over, and Rommel was moved to lead the troops on the coast of France. By the time Rommel was reassigned to France, he was starting to be more and more skeptical of Hitler, his strategies, and his goals. Rommel didn’t support the brutal actions of the SS, and eventually came to believe Germany would be better off negotiating an end to the war instead of continuing the carnage and death. He wasn’t alone in his beliefs…a group of men who agreed with Rommel even suggested that he should become Germany’s new leader. Though Rommel didn’t act on that suggestion, the mere fact he heard the suggestion ultimately helped seal Rommel’s fate. From the time he was in charge of coastal forces in 1943, Rommel spent his time and strategy building up coastal defenses. He set mines, built barbed wire obstructions, and even had troops flood areas of the coast to make it harder for troops to pass through. He also wanted to bring more tanks closer to the coast, but no one else agreed with him that this was necessary, and so his request was denied. In the summer of 1944, it would turn out Rommel was right to want more tanks on the coast. On June 5th, 1944 Rommel left France. He headed home to Germany so that he could be with his wife on her birthday…June 6th. When he left France, he and the rest of the German military thought the weather would be bad, and they didn’t have to worry about any allied movement on the coast. And they also thought if there was any that it would come at Calais. But the allies had used the German military’s weak intelligence system to get them to think any attack would come at Calais. While he was at home celebrating his wife’s birthday, Rommel received a phone call that shocked him. The allies had landed at Normandy on June 6th. The weather had cleared, and troops were storming the beaches. Rommel left Germany immediately to head to the front. He and other leaders established a counterattack plan, but allied fire was too strong and needed troops weren’t able to arrive. Rommel himself was injured badly by the Allied air strikes. In the end, 155,000 allied troops landed during the D-Day invasion, growing to one million after the initial push. The forces stormed through German defenses during the summer of 1944. To Rommel, it was clear that Germany couldn’t overcome the losses and the continued forward march of the Allies. He broke the news of his assessment to Hitler, telling him that a political solution was likely the best way forward at this point. The Fuhrer did not agree. This meeting would ultimately be the last between the two men. As victory for Germany was looking less and less likely, opposition to Hitler was growing in Germany. High-ranking military officials, including those close to Rommel, were starting to make plans to get rid of the Fuhrer. Assassination was among the options they contemplated. Was the Desert Fox an honest soldier or just another Nazi? Knowing Rommel disagreed with Hitler and was growing increasingly upset with the Fuhrer, the men plotting to overthrow Hitler tried to bring him into the fold. To this day, it’s unclear if Rommel was actually involved in a plot to assassinate Hitler or not, and if he was, it’s unclear just how much he knew. His widow later said Rommel only wanted Hitler brought to court, and nothing more. The Fuhrer thought Rommel wanted him dead, though, and in the end, that’s what mattered. On July 20, 1944, a group of conspirators smuggled a bomb inside a briefcase into a meeting at Hitler’s headquarters. There were supposed to be two bombs, but there was only time to prepare one…when it exploded, Hitler survived. Instead of a successful coup, the conspirators found themselves facing treason charges and the death penalty. Rommel was among those implicated. In October 1944, two of Hitler’s generals confronted Rommel. As SS troops surrounded the area, the generals told Rommel he had three options. He could go speak to Hitler directly and explain himself, he could go to court, or he could commit suicide there and then. Having explained to his family what was to happen, Rommel got into an SS car. He took the cyanide capsule that Hitler’s general had brought, and he died, wearing his Afrika Corps jacket and carrying his field marshal’s baton. The world was told he died of the wounds he sustained from Allied air attacks in the wake of D-Day, and he was buried with full military honors. Only after the war did the truth emerge. Battlefield genius Erwin Rommel greets Der Fürher, Adolf Hitler. Erwin Rommel was a talented military leader, but his military duty served a regime that had terrible intentions and committed horrific atrocities…Rommel’s life and death were intertwined with a watershed era in human history, an era upon which he left his mark.